I am not a fan of plastic toys, as they often end up in landfills after a very short play life, and plastic is derived from oil. The number of plastic toys in my household could be counted on one hand, yet I fear I have derived my children of the creativity and spatial relations Legos can teach children. Then I discovered Uberstix, which are compatible with other building toys, such as Legos, K’Nex and Erector. The Uberstix Scavenger Series utilizes recycled materials, such as straws, water bottles, and cups, to create working models. This is a unique idea in children’s toys to use upcycling, the process of using something of waste to create a product of greater value. My only concern is that Uberstix uses name brands, such as Starbucks or McDonald’s, in its list of suggested waste materials to use. Considering I try to raise my children as commercial-free as possible, this is concerning to me. I also think that Uberstix could much farther towards greening its product by making the products from recycled plastic. Despite my eco-concerns, my seven-year-old daughter and her father love to build with Uberstix. They have made many amazing creations, and this toy has kept my daughter entertained for days on end. Uberstix do break, but the instructions make suggestions about how to reuse the broken pieces. Dane Scarborough, the inventor of Uberstix, claims, “We are regarded by a lot of people in the industry as the greenest toy company out there.” I beg to differ, but I think the company may be headed in a good direction. Upcycling should be encouraged at every level, and children think it is fun to go on scavenger hunts for these items. Wow. Your kids are going to grow up playing with wooden blocks, and be so sheltered from reality when they get into school, they will end up getting pummeled regularly for being such outcasts – because of YOU. I’m sure you wear Birkenstocks and eat tofu. Uberstix work well with each other. The things you can make with recycled items are not that great. They break too easily and when you modify them their usefulness is limited. K’nex is better at building cool structures. Although you don’t like plastic toys and you don’t have many but in reality plastic is already playing a major role and you should expose your children to plastic toys. very cool. i’m passing this on to my husband. he’s a bit of a lego nerd. You can recycle your old building sets because Uberstix mate with Lego, K’Nex, Zoob’s, Erector Sets, and all other build systems. If you build the Pirate ship shown above using recycled materials, it will sail on an open lake under a high wind with no problem. 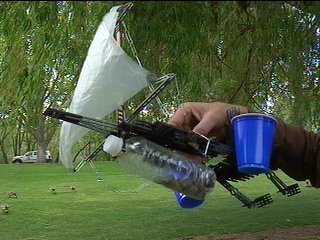 You can also recycle parts from an old RC car to make the Sail boat radio controlled! I agree, but literally, 99 percent of the toys are made of plastic and metal. And it is very difficult to keep away from plastic toys. I think wooden toys are another also natural option for kids. How Prepared is Your Family?